Personalized Hanging Address Plaque with Tractor -- the perfect way to identify your farm to everyone who passes on the road. 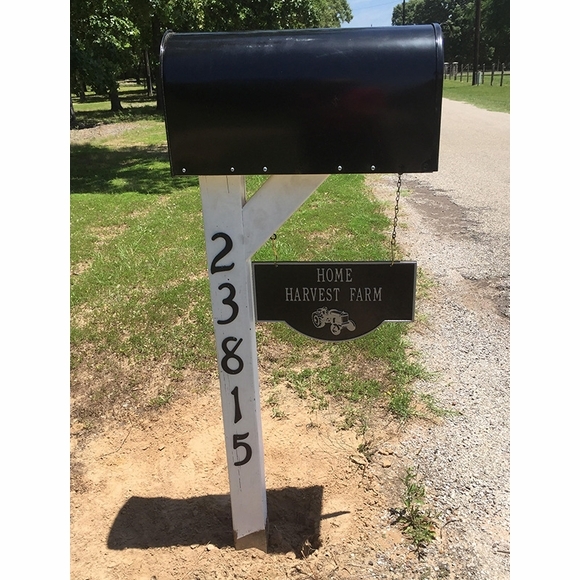 Display your name, address, or farm name on both sides of this hanging address sign. The same personalized text appears on both sides of the sign above a shiny and hard-working tractor. Optional pre-drilled bracket (saw as shown in small image above right or flame design) is sold separately (see Related Products). Or hang from your own bracket. Thank you to the Fords' of Chandler, Texas, for sending in the photo of their plaque shown in main image above.